I know I’ve talked a bit about overseas call centers in the past, and voiced my displeasure about dealing with them, but I wanted to cover the issue more in-depth this time. I’d also like to lay to rest any notion that I am a racist or bigot and don’t like people from other countries. That’s simply not true. In my two previous posts, I explained in some detail my experience with MetLife insurance. They, like so many big ‘ and no doubt very rich ‘ corporations employ overseas call centers to handle incoming customer service calls. This is a practice I dislike and here is the truth behind why I do. 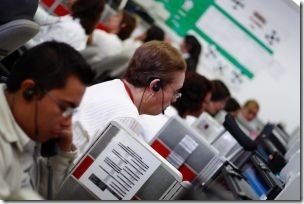 Firstly, call center jobs are most certainly jobs that Americans want. Yes, you might be able to argue that a company is not able to find and ample supply of Americans to hire for certain jobs like picking produce in the hot Sun for hours and hours. Make no mistake, those that are willing to do those jobs work their asses off and it is hard work. There is no arguing with the tremendous work ethic those people have. They work hard and probably do not get paid much to do it. If they are willing to do the job and they are in this country legally, they have every right to be hired to do whatever job it is they want. On the other hand, there is no way I could be convinced that Americans don’t want call center jobs. There are, in fact, still U.S. call centers taking calls for customers every day, which proves that point. That wraps up my first point, which is: Big, wealthy U.S, companies are taking jobs away from Americans by ‘outsourcing’ to overseas call centers. They say they do it to cut costs or remain competitive, but I don’t buy that. See my last post that proves hiring Americans to answer phones does not bankrupt companies. If Amica can do it, why can’t others? Another problem I have is the language and culture barrier. When I call a U.S. company for customer service I want the CSR (customer service representative) to understand me and any cultural references, slang or vernacular that is common in my country. On the other side of the coin, I also want to be able to clearly understand what the CSR is saying to me. I readily admit that some CSRs in overseas call centers spoke English extraordinarily well and I had no problem whatsoever understanding them. There have also been occasions where the overseas CSR had a very thick accent, which made it extremely difficult for me to understand them. It is likely that I already have a problem. That’s why I an calling for customer service! The last thing I need is for the problem to be compounded by talking with someone I cannot understand or who cannot understand me. My old ‘friends’ at TracFone were absolutely notorious for this kind of thing. Their call center was the absolute worst I have ever had to deal with it. That’s why I don’t carry a TracFone cell phone and never will again. Oh yeah, the text spamming was a big reason as well! Adding to the potential language problems are the nearly universal poor connection problems I have when I am talking with someone in an overseas call center. Their voices are often distorted and I can hear what sounds like hundreds of other conversations on the line at the same time in the background. Really gives a company a great image, don’t you think? It’s reached the point where I am surprised and delighted when I call for customer service and get someone from the U.S. on the line. For example, my conversations with the Amica CSR yesterday was actually fun! I was able to joke around with her, jokes that she understood and even laughed at! We even talked briefly about politics and the local weather. It was great! She was raised in the same country I was. The same culture. We could relate to each other on many levels. That makes for a superior customer service experience and elevates the consumer’s opinion of the company as a whole. Like I indicated in my last post, so far, I love Amica and have already told my oldest son he should call them for his new auto insurance policy. Big, rich, American companies listen up: A lot of us don’t want to talk to someone overseas when we call you! If you are a U.S. company I want to talk to a U.S. citizen when I call. If you are a German company, I will not complain if I get a call center in Germany on the phone when I call. Same goes for India or Costa Rica or wherever! For my fellow consumers who may think badly of me for complaining about talking to people in other countries when I call for customer service I have this to say. I do not blame the people on the telephone, and I am never rude or mean to them. If I were in their shoes I would probably jump at the chance for a good job as well. They cannot be blamed. I place the blame on the U.S. companies that choose to give jobs to people overseas rather than in the country where their customers are and where they are making their money. People need jobs more than ever in this lousy economy and giving jobs to Americans should be the first priority for American companies that depend mostly on American consumers to stay in business. That’s my opinion. Race, ethnic origin or geographic location has nothing to do with it. OK, I’ll concede that geographic location may be a factor due to those terrible telephone connections I so often endure when I am connected to an overseas call center. This whole ‘outsourcing’ started a number of years ago. I didn’t like it then and I don’t like it now. From the very beginning I’ve said that if they start giving American jobs away to people overseas and we end up with a lot of unemployment in this country (sound familiar?) there eventually be no Americans left with enough money to buy the goods and services that these companies with the overseas call centers are offering. Perhaps China and India will be wealthy enough to start buying a lot of stuff from American companies and their problems will be solved! Then they can move the call centers back here and we can all start learning to speak the different languages of the world so we can sit in a call center and answer calls from overseas customers all day for $3 an hour. Sounds great, doesn’t it? Bring the call centers back to the U.S. Sure, maybe a few CEOs would have to give up an extra vacation home, private jet or luxury yacht to do it, but wouldn’t that be a worthy sacrifice in order to provide some struggling families right here in the U.S. a chance to keep their home or feed their kids?